Figure 1. Colour fundus photographs of the left eye showing a hyperaemic, swollen optic disc and multiple white dots of the posterior pole. Colour fundus photographs of the left eye showing a hyperaemic, swollen optic disc and multiple white dots of the posterior pole. 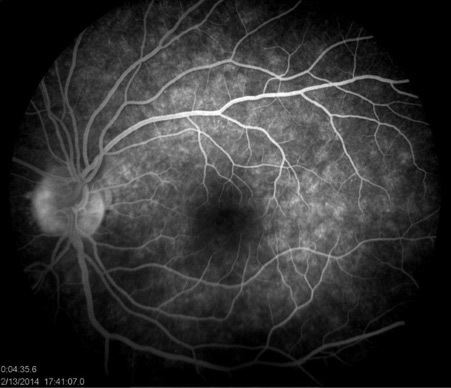 A 22 year old Asian female medical student presents with a one week history of multiple scotomas in her left visual field. She has not noted any photopsias. She is a low myope. She has no past ocular or past medical history of note. On examination, her corrected distance acuities were 6/6 right and 6/12 left. There was a Grade 1 left RAPD. Her intraocular pressures were normal. Both anterior chambers and the right vitreous were quiet but there were ½+ cells in the left vitreous. The right fundus examination was unremarkable. In the left eye, there was a hyperaemic, swollen optic disc and numerous small (approx. 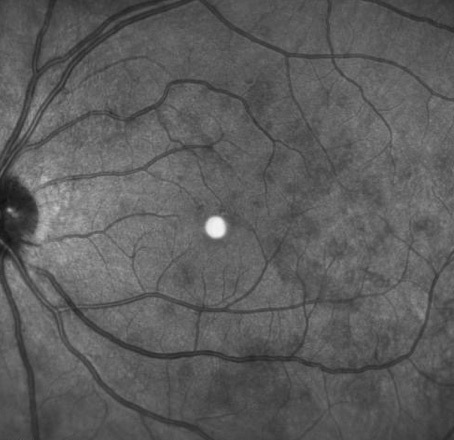 200 µm) white dots at the level of the deep retina / choroid located at the posterior pole but sparing the fovea. The fovea had an orange-yellow, granular appearance. The differential diagnosis of chorioretinal lesions can be divided into autoimmune, infective and masquerade aetiologies. Autoimmune conditions include the white dot syndromes (PIC, MFC, MEWDS, BCR, APMPPE and SC)* and sarcoidosis. Infective causes include tuberculosis and syphilis and primary intraocular lymphoma can be a masquerade. The orange-yellow, granular appearance of the fovea is pathognomonic of this condition, although it may take several days to develop. Fundus fluorescein angiography (FFA) showed multiple clusters of early punctate hyperfluorescence (“wreath-like” hyperfluorescence) with late staining and late leakage from the disc (Figure 2). Indocyanine green angiography (ICGA) revealed multiple, small hypocyanescent dots evident in the late phase (Figure 3). These lesions characteristically outnumber the lesions visible either ophthalmoscopically or on FFA. In some cases, these lesions are visible in the intermediate or early phases also. Fundus autofluorescence (FAF) imaging demonstrated hypoautofluorescent spots which spared the fovea (Figure 4). FAF lesions in the acute phase can be a mix of hypoautofluorescent and hypoautofluorescent spots. FAF abnormalities persist for weeks to months, long after the spots seen ophthalmoscopically and on FFA and ICG have disappeared. 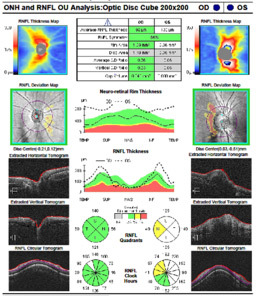 Optical coherence tomography (OCT) revealed multiple areas of focal attenuation of the photoreceptor inner segment ellipsoid band (previously referred to as the photoreceptor inner segment / outer segment junction) and a dome-shaped hyperreflective lesion in the subretinal space (Figure 5). These disruptions resolve over a period of weeks. OCT imaging of the optic disc confirmed optic disc swelling (Figure 6), which was reflected by the enlarged blind spot (EBS) seen on the Humphrey Visual Field (HVF) 24-2 (Figure 7). The orange-yellow granular fovea is pathognomonic for MEWDS. Five days later, the white dots visible ophthalmoscopically have completely disappeared (Figure 8). Eight weeks later, her vision has improved to 6/9, all the scotomas have resolved except the central one, and she is no longer aware of an EBS. 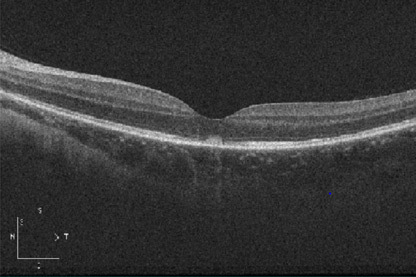 OCT imaging confirms all the areas of focal attenuation of the photoreceptor inner segment ellipsoid band have resolved except the subfoveal one and there is no longer an EBS on HVF 24-2 testing, although the optic disc oedema persists. Three months later, her vision has improved to 6/6 and there has been complete restoration of the subfoveal photoreceptor inner segment ellipsoid band. 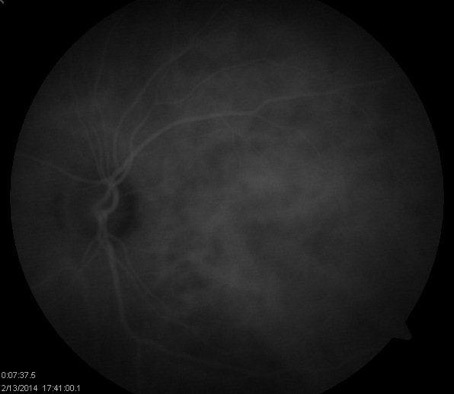 MEWDS results from idiopathic inflammation of the retina and choroid. It is most common in healthy, young, myopic females and typically has an acute and unilateral presentation. In one third of cases, there will be a preceding viral illness. MEWDS is self-limited and has an excellent prognosis, with most patients recovering full visual acuity and visual field over a period of one to two months. 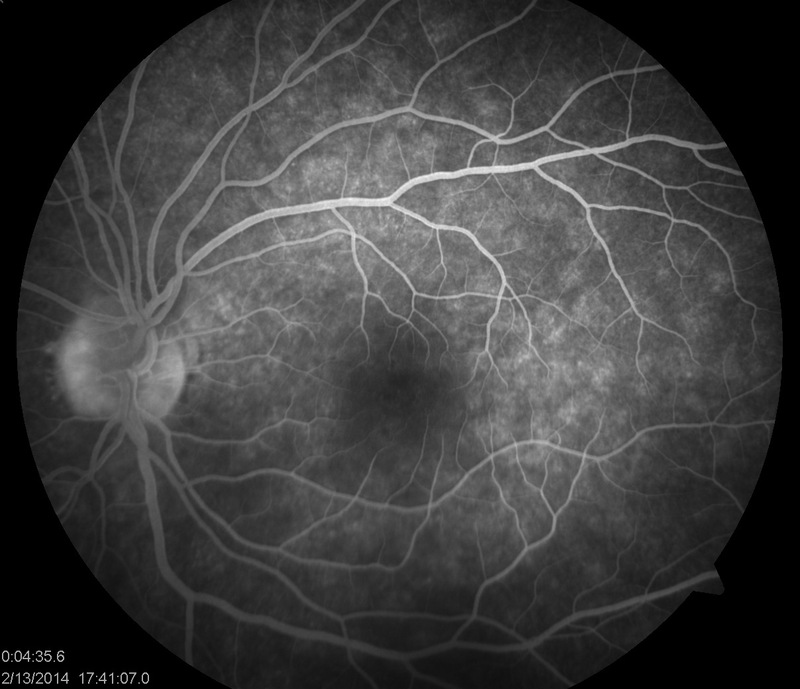 Very rarely, complications such as chorioretinal scarring and choroidal neovascularisation or progression to AZOOR (acute zonal occult outer retinopathy) can occur. dell’Omo R, Pavesio CE. Multiple Evanescent White Dot Syndrome (MEWDS). Int Ophthalmol Clin 2012;52(4):221-228. Hangai M, Fujimoto M, Yoshimura N. Features and function of Multiple Evanescent White Dot Syndrome. Arch Ophthalmol 2009;127(10):1307-1313. Fine HF, Spaide RF, Ryan E H Jnr et al. 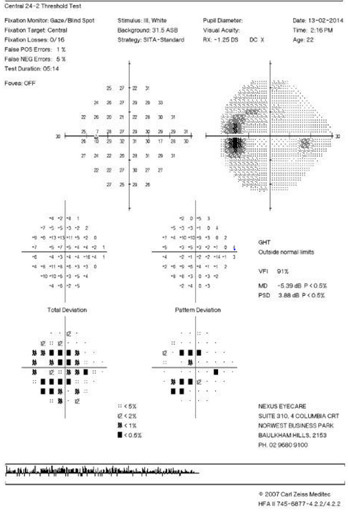 Acute Zonal Occult Outer Retinopathy in patients with Multiple Evanescent White Dot Syndrome. Arch Ophthalmol 2009;127(1):66-70.